The Aidi has been kept by the Berber tribes for centuries, primarily for protection. They guard goats and sheep from predators such as jackals, as well as their owner's tents and possessions. The most aggressive and alert dogs are staked around the outlines of the nomadic camp at night. They will fight off predators and any human that dares to trespass. As a secondary role, the Aidi is used to track game. Often they are paired with the faster Sloughi. Once the Aidi has located the prey, the Sloughis are released to catch it. These dogs are known by a wide variety of names due to having slight local variations throughout its homeland. It is known as the Aidi in Morocco and as the Kabyle, Ouled Nail, and Shawia in different parts of Algeria. It has also been called a sheepdog or shepherd due to being first recognized as the Atlas Sheepdog in 1963. However, it has never been used as a herder or sheepdog in the European sense. Although the mistake was corrected in 1969 the confusion persists with its name. While the Aidi is recognized as Moroccan, it hails from the Atlas Mountains which stretch across several countries. In modern times this includes the countries of Libya and Algeria. An ancient breed, their exact ancestry is unknown, although most believe it was brought to the region by the Phoenicians. Others suggest that it was developed from native dogs, perhaps from pariahs selectively bred into a guardian role. 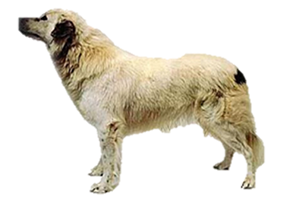 Some experts have theorized that the Aidi is the ancestor to the Great Pyrenees, brought to the Iberian Peninsula after the Muslim conquest of the Middle Ages. During this time Arab and Berbers had control over what is modern day Portugal, Spain, Andorra, Gibraltar, and a small portion of France which included the Pyrenees Mountains. Today the Aidi is most commonly found in Morocco. This led to Morocco being recognized by the Fédération Cynologique Internationale (FCI) as the breed's country of origin. There it is gaining ground as a companion animal and police dog. A smaller portion of dogs still hold their traditional role in remote mountain areas of Northern Africa. Is the Aidi Right for You?